Too often many approach mental health issues as personal problems, rather than reflective of greater social and political injustices -- or perhaps even caused by. I think it's one of the reasons mental health problems are not taken seriously enough. Yet "the personal is political." For centuries, sexism, racism and other forms of discrimination have crushed spirits. 1. This 2012 study reveals how Islamophobia negatively affects the mental health of Muslims worldwide, ranging from increased feelings of anxiety to depression. What's more, the study shows one does not even need to actually face discrimination; just the knowledge society fears and shuns those who look like you affects psychological health. That means it's not just Muslims who can suffer from this, but Sikhs, Hindus and even atheist South Asians. 2. The discrimination is taking its toll on children, leaving effects that last into adulthood. For example, a 2014 study /Sikh Coalition study reveals two-third of Sikh children donning turbans are bullied, while 50 percent of all Sikh children experienced bullying. Bullying can cause severe mental health damage. Indeed, the effects can even be worse than abuse. I was nine years old when I became painfully aware of the fact that Sikhs living in the United States are at heightened risk of experiencing brutality. Living in New Jersey at the time, my family visited Ground Zero shortly after 9/11 to see the site and pay our respects to those who lost their lives. I vividly remember the smell of the ashes, the omnipresent dust and debris, the solemn, grim, looks on everyone's faces -- but most vividly I remember dirty looks directed at my dad. My hero. My friend. A person who adds enormous value to the world and who did not deserve the targeted stares of negativity and suspicion aimed at his turban. I remember feeling several different emotions: I was confused - confused as to why people felt entitled to judge someone they didn't know. I was angry - angry because something as seemingly harmless as a dirty look in fact stood for disgust, discrimination, and unfounded hatred. I was sad - sad because even at such a young age I understood that intolerance and ignorance are difficult problems to overcome. What I've seen in the Muslim community psychologically is feeling a denial of emotion, feeling very disconnected that we can't display this emotion because no one will believe it. No one will tolerate it, no one cares that we're upset... -- Mental health professional Kameelah Rashad said in an interview. This is dangerous. Numerous studies illustrate excessive emotional repression can lead to all sorts of disorders. So what can we as South Asians do to help? Well, for one thing, now more than ever South Asians need to start talking about mental health problems. 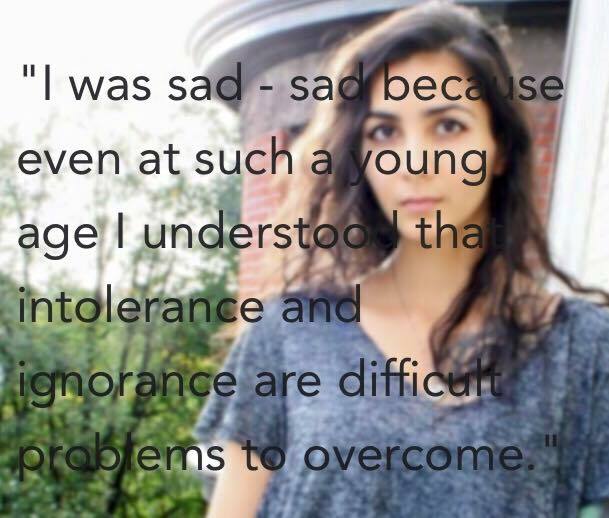 Many young people feel scared to talk to others outside of our community out of genuine fear. They should feel comfortable to look to their own for support and advice without fearing stigma. For another, South Asians who are not Muslims need to stand up for those who are more than ever. I write as a current agnostic, but somebody who was brought up Hindu Gujarati. Besides the fact we are all experiencing discrimination, we are all equally human beings. If you choose to let old resentments get in the way, you're engaging in the same hatred fueling racism against us all. While I've listed a few resources below to help tackle young people currently dealing with Islamophobia, I'd love to hear from others to feature your voices, resources, and suggestions for The Desi Wellbeing Project. I am always trying to collect stories to normalize mental health issues in the South Asian community for the project. I aim to encourage and celebrate those South Asians who cultivate wellbeing. But I also want to start to stress the link between the greater social issues - past and present - that are contributing to high rates of emotional distress in our community. Most importantly, I want to also help open up a conversation about how to deal. Tell me about your experiences. I'd love to know how Islamophobia affected you growing up and how you're healing. If you're young, open up about what you're going through. Tell me how you're coping. If you're an organization or a therapist, give me your tips. Let me know how you help. You can email me at thedesiwellbeingproject@gmail.com.